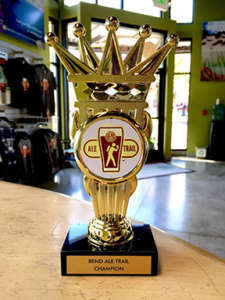 Fans of craft beer can enjoy an entire month of trophies, extra prizes, and promotions along the Bend Ale Trail. (BEND, Ore.) When you think of October, you probably picture Halloween costumes and candy. July? Bring on the fireworks and parades! This November, organizers of the Bend Ale Trail want Bend, Oregon visitors to equate this humble month with a bounty of Bend craft beer. During Bend Ale Trail Month, anyone who brings a completed Bend Ale Trail atlas to the Bend Visitor Center from November 1-29 will receive an official Bend Ale Trail trophy. The trophy will be awarded in addition to the normal prize, a Silipint pint glass. Additional prizes—including lodging packages, t-shirts, brewery gift certificates, and more—will also be awarded via radio promotions and to beer drinkers using the #bendaletrail hashtag on Instagram. In addition to the trophies, social media giveaways, and regular Bend Ale Trail prizes, everyone who stops by the Bend Visitor Center in November to turn in a completed Bend Ale Trail passport will be entered in a drawing for a Beerventure getaway. The prize package includes lodging, brewery gift certificates, and a tasting package for the 2015 Bend Brewfest August 13-15, 2015. Visitors can check out Bend Ale Trail to learn more about Bend Ale Trail Month, look for lodging deals, and download the free Bend Ale Trail smartphone app.